HiRISE acquired two dramatic views of the Martian moon, Phobos, on 23 March 2008. Observation PSP_007769_9010, acquired at a distance of 6,800 kilometers from Phobos, provides surface detail at 6.8 m/pixel scale and a object diameter of about 3,200 pixels. The second observation, PSP_007769_9015 providing a closer look at 5,800 km, views the surface at slightly more detail (5.8 m/pixel with an object diameter of about 4,000 pixels). 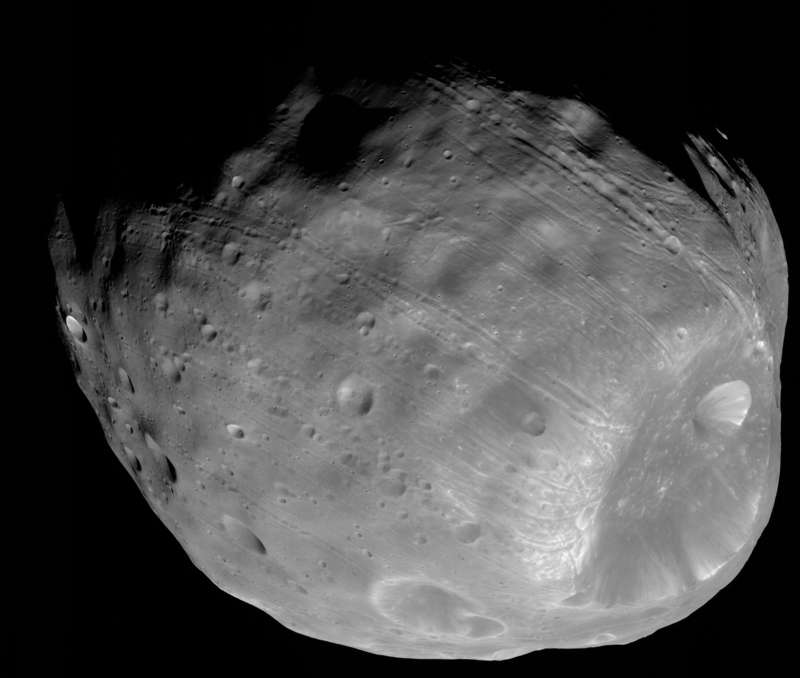 The illuminated part of Phobos visible in the images is about 21 km across. Images from previous spacecraft have been of smaller pixel scale (for example, Mars Global Surveyor got data at 4 m/pixel, because this spacecraft came closer to Phobos), but the HiRISE images have greater signal-to-noise, making the new data some of the best ever for Phobos. Both PSP_007769_9010 and PSP_007769_9015 were made by combining data from HiRISE's blue/green, red, and near-infrared channels. The color data accentuate details not apparent in the black and white images. 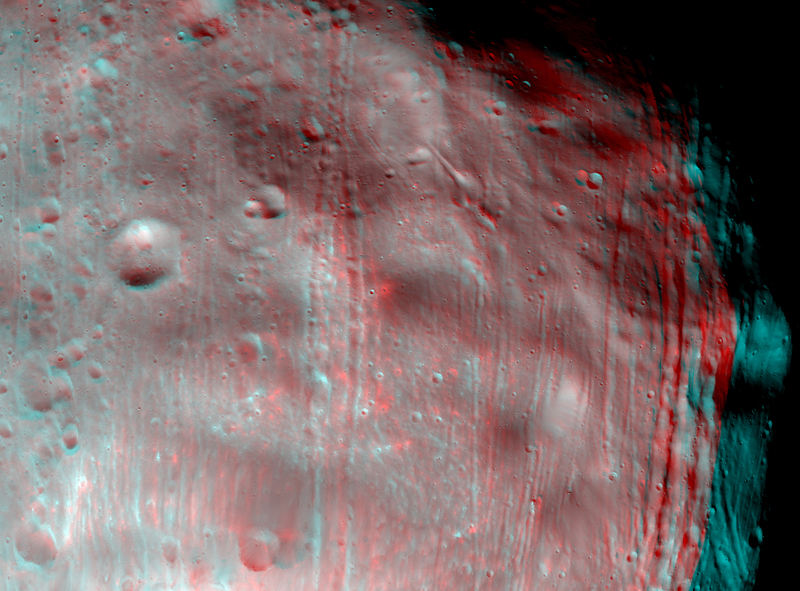 For example, materials near the rim of Stickney appear bluer than the rest of Phobos. Based on analogy with materials on our own moon, this could mean this surface is fresher, and therefore younger, than other parts of Phobos. This is a close-up and enhanced part of image PSP_007769_9015. In the original image, detail in the black, un-illuminated portion is not apparent. However, seen in enhanced detail here, craters are clearly visible. This faint illumination is from reflected light off of Mars ("Marsshine"). This is directly analogous to "Earthshine," where reflected sunlight from our planet illuminates the dark side of the Moon. 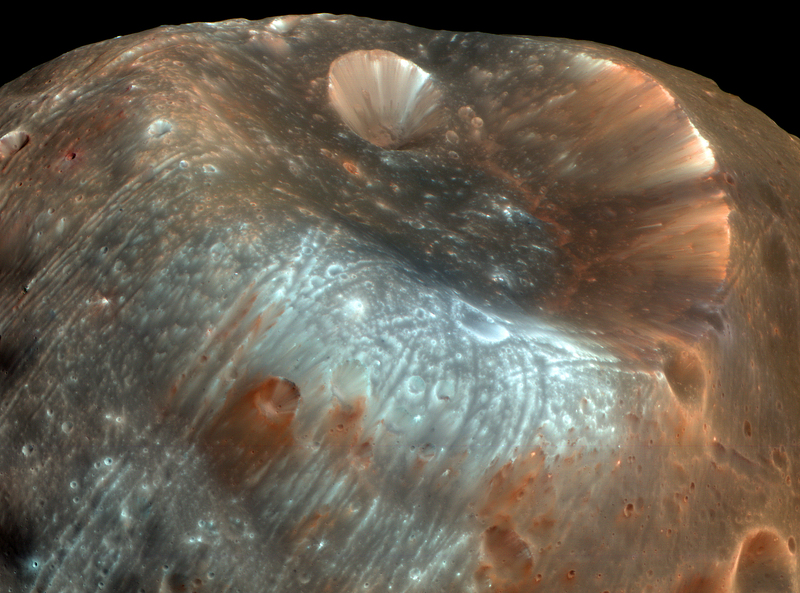 The ability to see features on Phobos illuminated by Marsshine demonstrates the high sensitivity of the HiRISE camera. 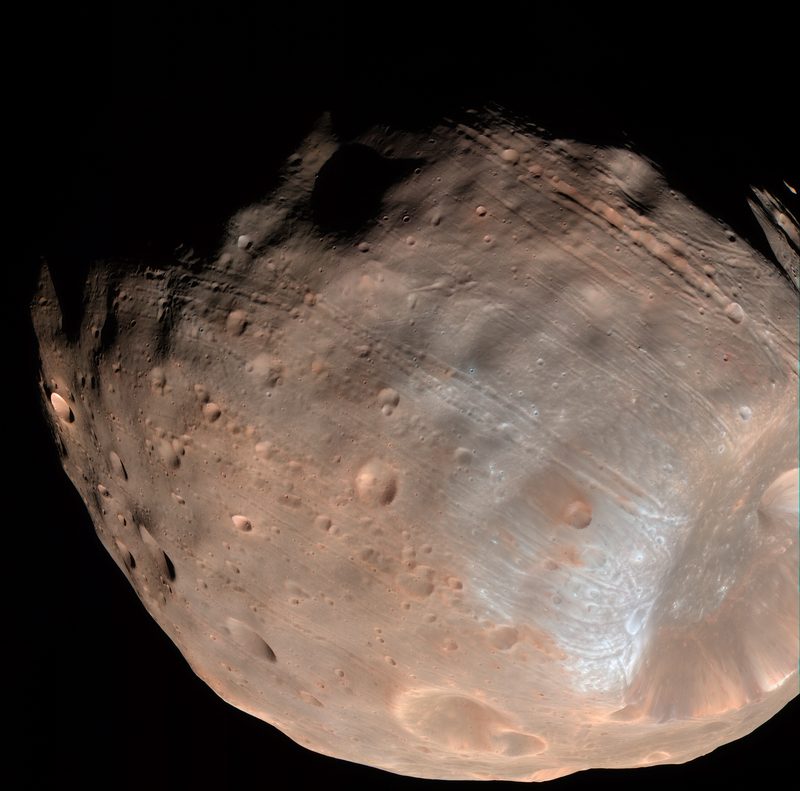 Phobos, and the second Martian moon, Deimos, are interesting for several reasons. Both objects are small, with average diameters of just 22 and 12 km, respectively. At this size, their gravity is insufficient (less than 1/1000th of Earth) to pull them into spherical shapes, in contrast to the larger moons and planets in the Solar System. Both moons are tidally locked to Mars, meaning, like our own moon relative to Earth, they present the same side to Mars all the time. 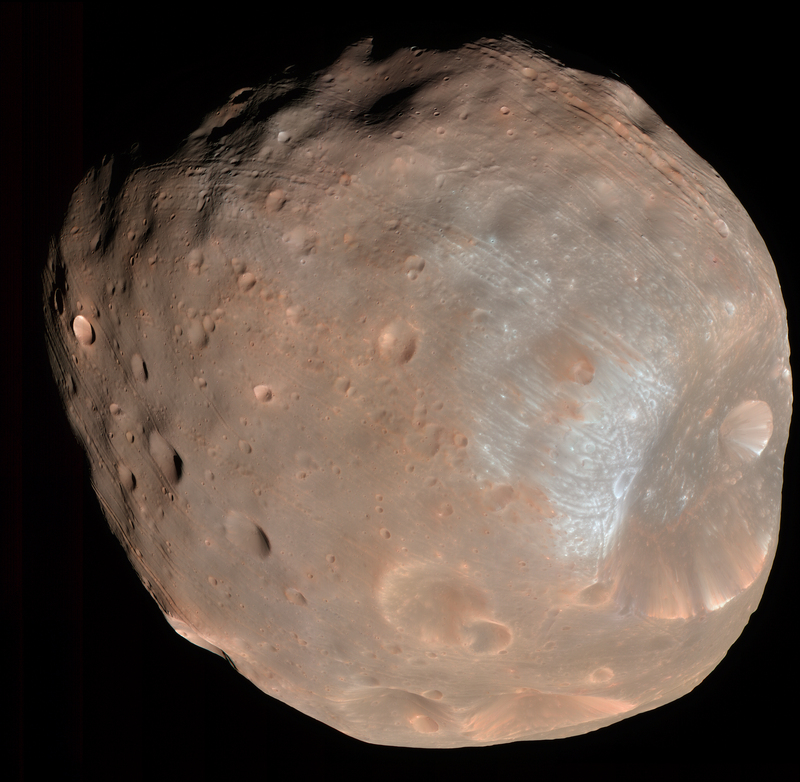 The small size and composition (determined from spectroscopy) of Phobos and Deimos make them very similar to some asteroids. Most asteroids are located in a belt between Mars and Jupiter, with others having orbits that cross that of Mars. 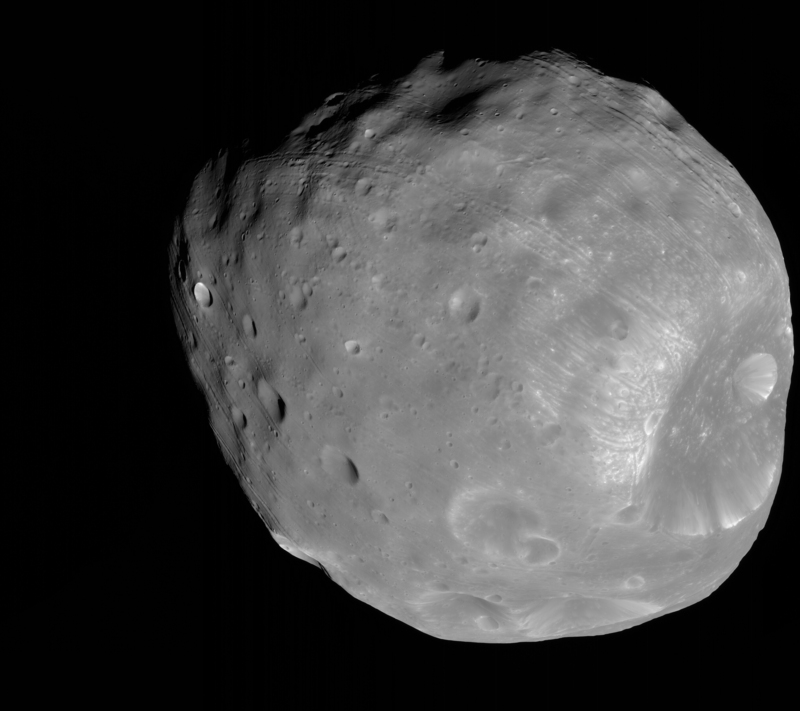 Therefore, it is possible that Phobos and Deimos are captured asteroids. Other hypotheses are that they formed with Mars in the early Solar System, or are composed of material blasted off of Mars by impacts. HiRISE can provide new imaging, color, and topographic (from stereo) data on these objects, thereby helping to constrain their origin and subsequent evolution. 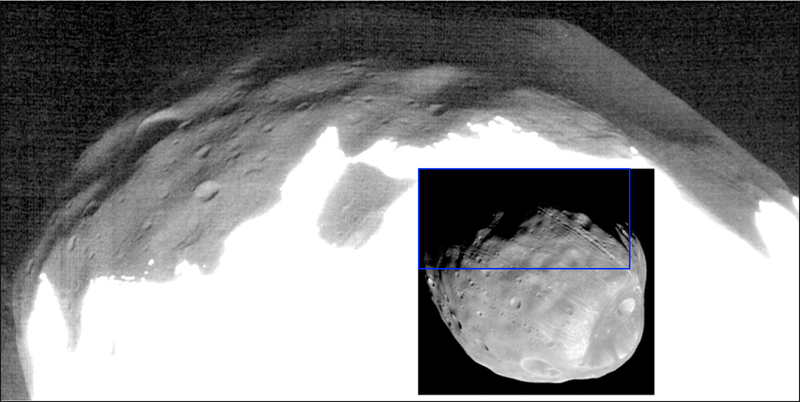 While this caption focuses on observations of Phobos, images of Deimos may be acquired at a later date. 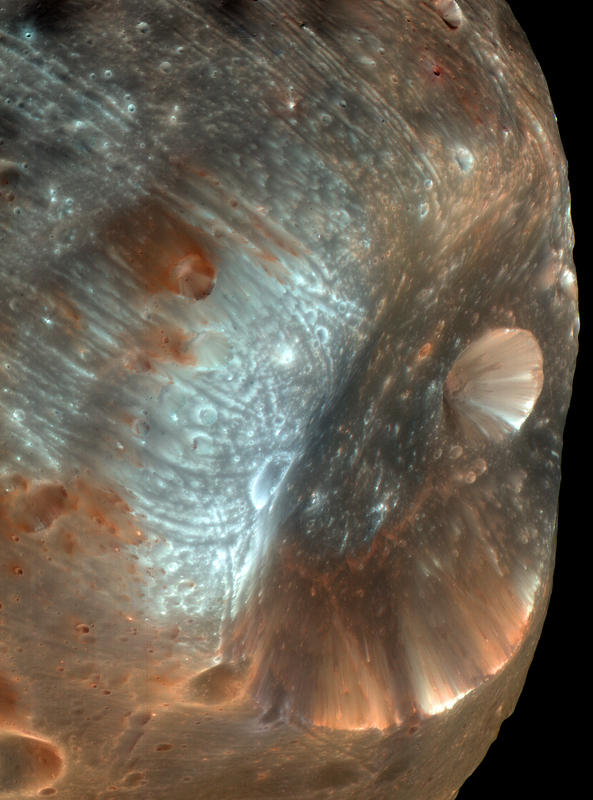 The CRISM (Compact Reconnaissance Imaging Spectrometer for Mars) instrument on MRO imaged Phobos and Deimos in 2007.